HWY SONG consists of a circa 1920’s Stella acoustic guitar with a video monitor fitted into its’ sound hole. The monitor plays a silent cut-up loop of a stretch of highway as seen from a moving car, a subtle evocation of the American road movie, the ‘road song’, and the potent and persistent mythology of the guitar. Plenty of highway songs have been written, this is a visual ode to them all. The video was shot with a toy Pixel camera and then tinted, edited and generally fukked with further. The piece is one of a number of 'modified instruments' I have been building of late. It has been exhibited during my sound/installation show 'We are Everywhere and Nowhere, All at Once' at Studio 5 Beekman in NYC in May 1999, and also as part of a sound installation I made for the Copenhagen Museum of Contemporary Art's show entitled 'SSSHHHH...', in November 1999. In April 2000 it will be on display as part of the 'Sonic Boom' show at the Hayward Gallery in London's Royal Festival Hall. One piece is virtually silent; Lee Ranaldo's HWY SONG, an old acoustic guitar with a television screen in the soundbox, a highway unrolling. The lost song of the lonely road of myth. Staring at this work one longs, suddenly, for a blast of Hank Williams, say, or even Bruce Springsteen, or Ranaldo's own group, Sonic Youth, going through one of their detuned guitar pile-ups; just something to link us back to the real world, an admittance of popular culture. 'Sonic Boom: The Art of Sound': Hayward Gallery, SE1 (020 7261 0127), 27 April to 18 June. Lee Ranaldo is a New York based guitarist, writer and artist. 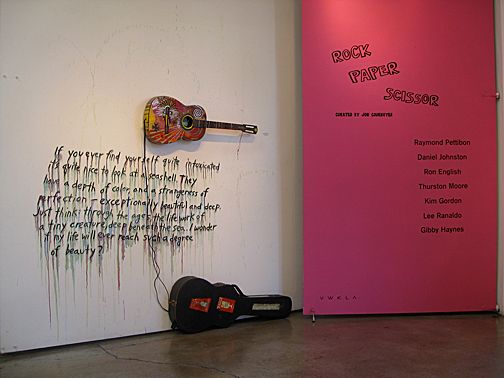 Best known for being a founder member of Sonic Youth, the New York guitar noise band that has been recording and performing successfully since 1982, Ranaldo has published a significant body of work as a solo artist, ranging from spoken word recordings and readings, solo guitar albums to memoirs and art gallery installations. 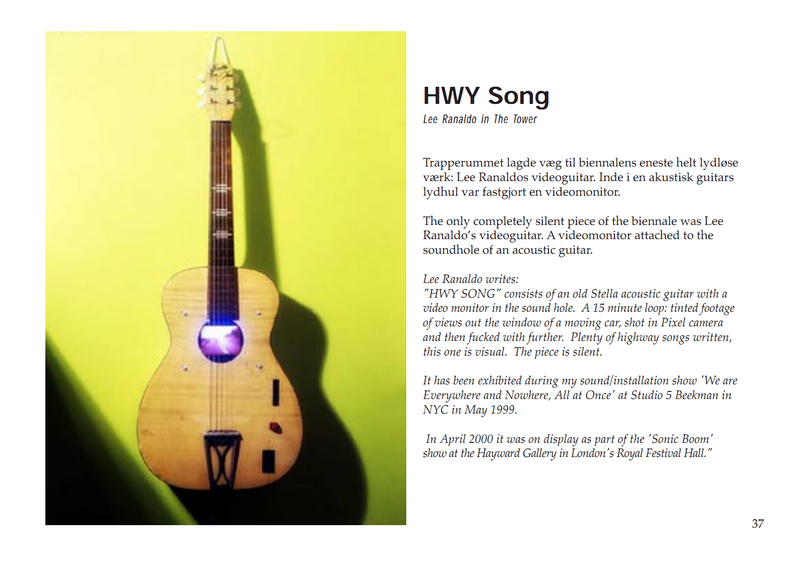 His HWY SONG is a 1920s Stella guitar fitted with a red monochrome TV monitor in its soundhole, playing a silent cut'up loop of a stretch of highway.